There's still time to plant courgette seeds (all through June) as they’ll quickly ramp away in the warmer weather. Sow at 2cm depth and 36cm apart in very fertile soil (they are greedy plants). Keep well watered. ​You can also sow indoors, hardening them off for a week before planting out. With its unique climbing habit this variety is a great space saver for plot holders who haven’t room for a ground trailing variety which can easily take up whole beds! In order to tease it upwards, its long stems will need tying onto a trellis, fence or netted structure. 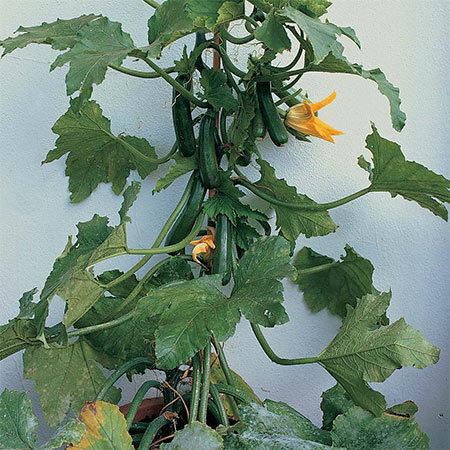 Courgette Black Forest produces large numbers of dark green, smooth, cylindrical 15cm courgettes. Pick regularly, before they become too big (marrow size! ), throughout the summer months. Parts of its flowers are edible.